Arguably the most famous and simultaneously infamous square in the world, right in the heart of Moscow, and next to the nerve centre of Russian and formerly Soviet power: the Kremlin, seat of Tsars, Soviet leaders, and now the President of the Russian Federation. More background info: It was here that all those massive military parades took place during the Soviet era – and again now, as Russia's "modern tsar" Vladimir Putin took a liking to those things and revived the parades (probably also to show some muscle in the politico-military sense). Back in the USSR days, the whole Politburo would gather to oversee those parades on Red Square (namely from the balcony of Lenin's mausoleum, which overlooks the square) – the position of its members in relation to the General Secretary being an indication of relative influence within the Party … In many ways, then, this was also right at the pulse of the Cold War. Those who lived through (parts of) that era will get a strange sensation out of standing on Red Square now and will no doubt have flashes of memories of what it looked like on the TV back then. Otherwise, and for those too young to remember the Soviet Union, it's just a very grand square – and where once the famous GUM department store opposite the Kremlin displayed bare shelves, the cutting edge of expensive designer goods now satisfy the desires of the new Russian rich elites. To the north and south magnificent examples of Russian-style buildings complement the ensemble, the star piece (and single most recognized church in the Eastern hemisphere) being the über-iconic St Basil's Cathedral. Incidentally, the name Red Square, or Krasnaya Ploshchad (Кра́сная пло́щадь) in Russian, does NOT refer to the colour of the square (which isn't red) or the Kremlin and cathedral walls (the Kremlin walls weren't always painted red), nor is it a reference to the colour that's come to stand symbolically for the notion of communism. It's quite simply that the word “Krasnaya” is ambiguous, meaning both 'red' and 'beautiful' (or rather: one or the other), and it is the second meaning that applies here. The Kremlin is of course still the power centre of Russia and its opulent palace rooms still help to put foreign state visitors in their place, as it were. Obviously, as many of the Kremlin's buildings are in use for the running of this huge country, only some of the other parts are accessible for the public, but those include some of Russia's greatest riches. By the way, again, there is also a common misconception that the Kremlin with its walls and towers is somehow prototypical for a genuinely Russian style of architecture. In actual fact it's an Italianate style, and they were indeed designed by Renaissance architects from Italy who had been specially invited for the job in the late 15th century. The churches within the Kremlin as well as St Basil's on Red Square, on the other hand, can indeed be regarded as classics of typical Russian ecclesiastical architecture style. 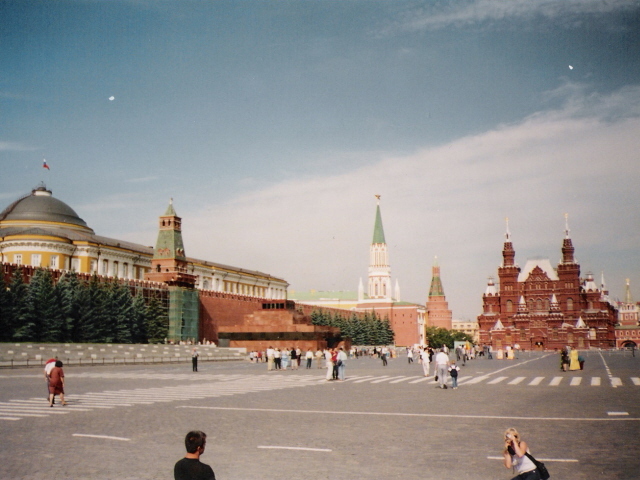 What there is to see: For the dark tourist, the main attraction on Red Square is Lenin's mausoleum, which therefore has its own separate entry here. Next to the mausoleum, however, there's a whole pantheon of Russian revolutionaries and Soviet leaders buried at the Kremlin Wall necropolis, including the most notorious of them all: Josef Stalin. In fact, Stalin was initially placed inside the mausoleum next to Lenin, but eight years later he was almost surreptitiously removed and interred in a deep grave next to the mausoleum The only Soviet leader missing, ironically, is Stalin's successor Nikita Khrushchev (buried at Moscow's second-best final resting place available, Novodevichy cemetery). Just around the corner of Red Square and all those tombs at the northern tip of the Kremlin Wall and Alexander Gardens is a Tomb of the Unknown Soldier with an eternal flame. Here you can watch the somewhat weird spectacle of the changing of the guards (expect exaggerated John-Cleese-like goose-stepping and such like). I've been to Moscow and Red Square twice, once quite a long time ago in 1999 and again 18 years later in 2017. Both times I encountered a group of staunchly died-in-the-wool old-school communists solemnly parading portraits of Lenin and Stalin and carrying old Soviet red flags. In 1999 I thought they were just a leftover from the break-up of the USSR and the economic crises that followed. To see these old communists (at their advanced age) still going in 2017 surprised me a lot more. The most drastic difference between my two visits was the look of Red Square itself. As you can see in the gallery below my first encounter gave me the full sweeping panorama of the square … you could well imagine the big Victory Parades held here annually on 9 May (Victory Day in Russia – cf. German-Russian Museum). They were such a defining visual feature of the USSR's might back in the Cold War years – and after a break following the collapse of the Soviet empire these parades have been reinstated by Vladimir Putin, again as a grand show of military power. It must be quite a spectacle to witness close up. The Kremlin as such does not offer much in dark sites proper, though the great follies of the Tsar Bell and Cannon do perhaps qualify, if not as dark, then at least as weird and quirky. They were both the largest of their kinds ever made, and neither ever worked. 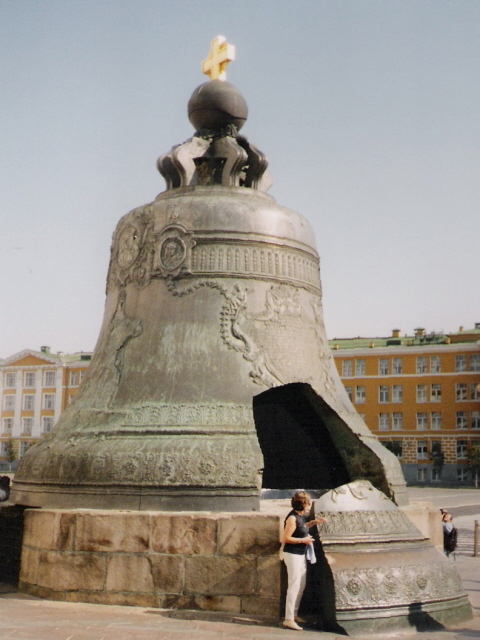 The Tsar Bell (weighing a whopping 216 tons) cracked before it could make a sound and was just placed on a plinth in the Kremlin's grounds. 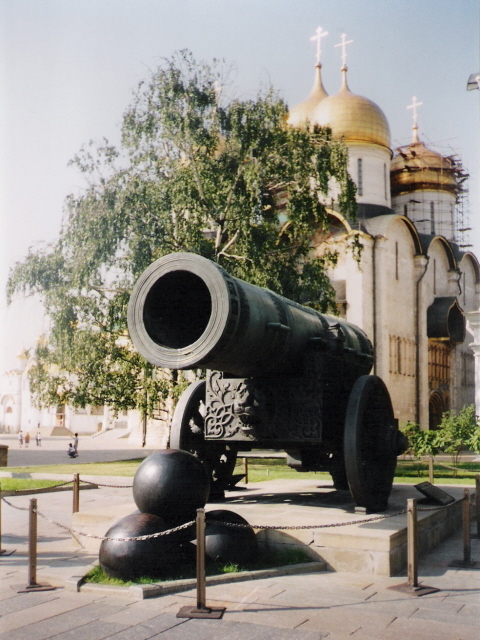 The Tsar Cannon is, at 40 tons, the largest howitzer (or 'bombard' or mortar) type cannon ever madeat least by calibre (89 cm, or 35 inches!) – but it never fired a single shot (although rumour has it that it must have been at least attempted once). In front of the gigantic barrel is a stack of four massive cannonballs roughly of the size fitting this calibre, each weighing about one ton. But these cast-iron balls are only for decoration and were added much later. They were never intended for being fired by the cannon. The uselessness of these two objects gave rise to an analogy by which the Soviet Union's biggest hydrogen bomb ever detonated (at 50 megatons, in 1961, on Novaya Zemlya testing ground) acquired the nickname Tsar Bomba (see Sarov) – because it too was totally useless for deployment as an actual weapon due to its massive size and weight (27 tons!) – see also Central Armed Forces Museum. The rest of the Kremlin rather displays grandness of a not-so-dark nature, but grandness on a massive scale all the same. 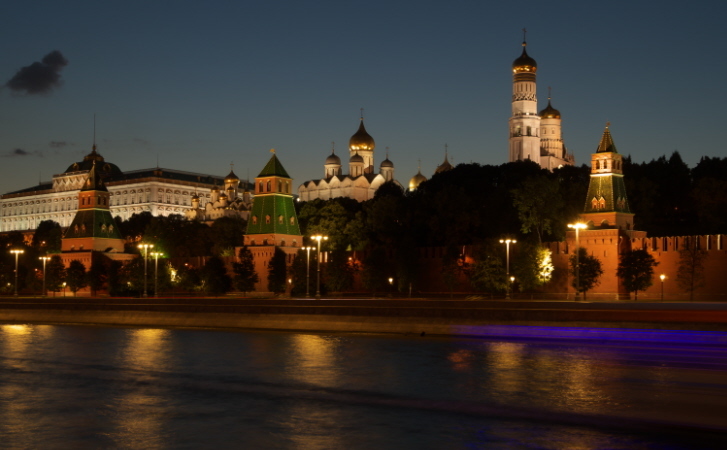 Don't just view the Kremlin from Red Square and from the inside: also take a walk along the embankment on the opposite side of the Moskva River to the south of the Kremlin, from where you get the best views of the whole ensemble of towers and imposing walls and the churches and palaces beyond. Location: bang in the centre of Moscow. Red Square is to the north-east of the sprawling Kremlin complex. And the visitors' entrance to the Kremlin itself is at the Troitskaya (Trinity) Tower on the north-western side. 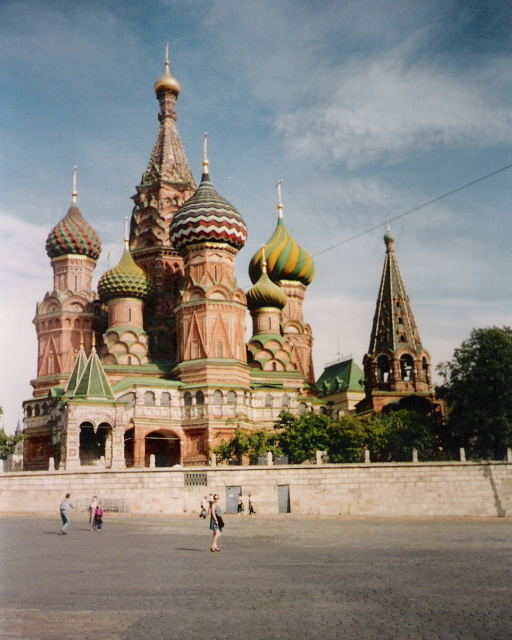 Access and costs: Red Square free and easy (except the mausoleum), Kremlin prices varies. 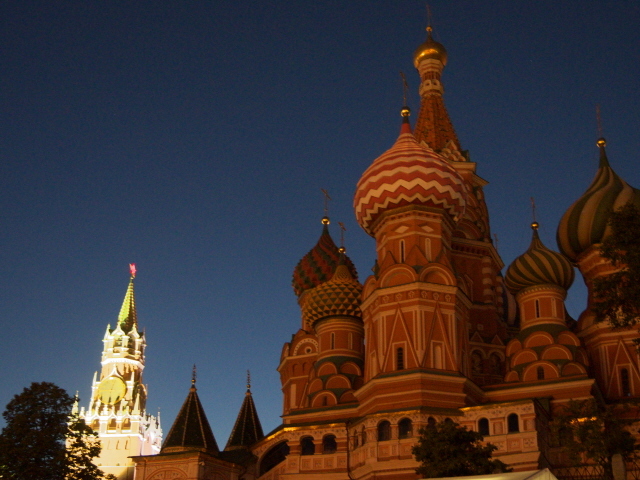 Details: To get to Red Square is as easy as it gets in the megalopolis that is Moscow. The Square is surrounded by various metro stops – the best are Borovitskaya, Alexandrovsky Sad and Biblioteka imeni Lenina (all connected with each other through underground passages). Most of Red Square is accessible for free most of the time (but occasionally events like concerts or parades take place on the Square). The section where the Lenin mausoleum is will be cordoned off for the queues there. Access to the Kremlin can be restricted due to state visits, but normally you can get to the grounds daily (except Thursdays) between 10 a.m. and 5 p.m.; entrance to the Treasury at the Armoury is more restricted: batches of visitors are only let in at certain times, at 10 a.m., 12 noon, 2:30 p.m. and 4:30 p.m. Note that you are not allowed to take pets or large bags, although at least the latter can be deposited for free at the left luggage facility in Alexander Garden (separate from the ticket office). 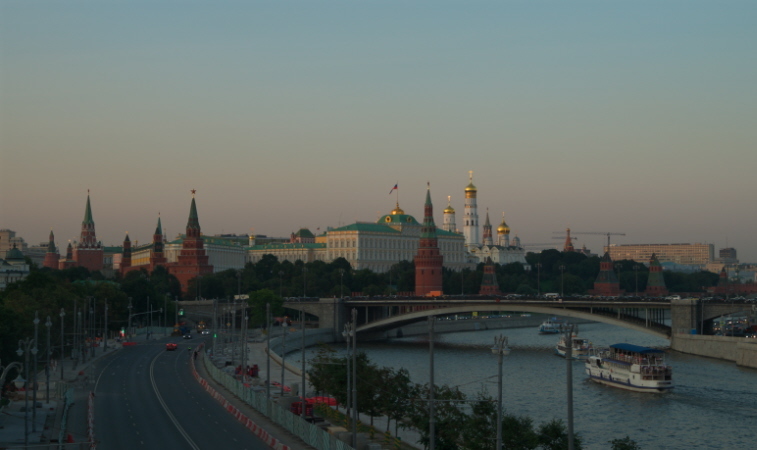 Admission to the Kremlin grounds, with most of the cathedrals and other visitable buildings included is 500 roubles; not included is the Museum of History of the Kremlin Architecture, located in the Ivan the Great Tower (again, access only at certain times of the day), which costs an extra 250 roubles. The Armoury comes in at an even heftier additional fee: 700 roubles. So if you want to do it all, it'll add up. You could spend yet more money by doing a guided tour or hiring an audio guide that has to be ordered in advance. Think carefully if you really want such a full barrage of guiding. Maybe you're more like me and would rather walk around unguided and only take in in detail what you really want. Note that you're not free to wander just anywhere within the Kremlin's grounds. There are areas marked by white lines that you're not supposed to cross. If you do, you'll attract the angry whistling of guards. Just step back to where they want you to be. Time required: Wandering round Red Square, where it is not cordoned off, e.g. for visitors to the Lenin Mausoleum, can be limited to just 20 minutes or so, more if you want to just stand and savour the atmosphere more. 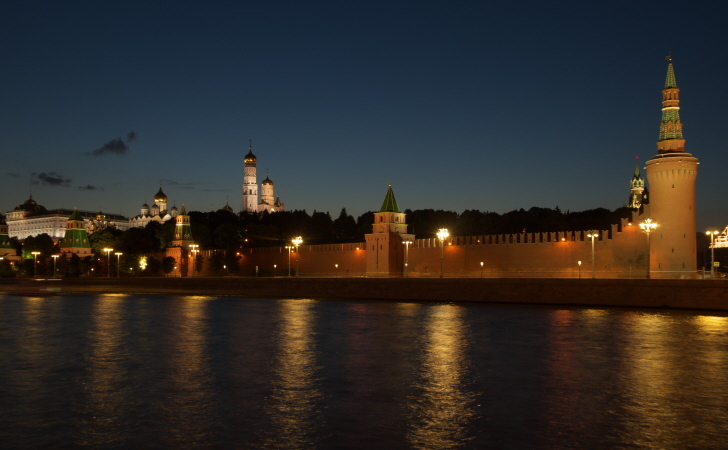 Walking all around the Kremlin from Red Square, along Alexander Garden and along the Moskva on Sofiyskaya Embankment and back to Red Square takes between 45 and 60 minutes. A full tour of the inside of the Kremlin will take considerably longer, but you can prioritize and be selective, if you're pressed for time … but don't miss the Tsar Cannon and Bell and the Treasury in the Armoury Museum. Still, with all the queuing and entrance restrictions, it's best to allocate a good few hours, or up to half a day. Combinations with other dark destinations: see under Moscow. The nearest other dark site to the Kremlin is the Lubyanka building (formerly HQ of the KGB, now FSB) a short walk to the north-west along the pedestrianized Nikolskaya Street. Combinations with non-dark destinations: Red Square and the Kremlin are also Moscow's premier mainstream tourist sights anyway. Within the Kremlin, the churches and, in particular, the unbelievable riches of the Treasury in the Armoury Museum are definite highlights. On Red Square, St Basil's Cathedral is considered by many to be the very pinnacle of Russian-style church architecture – though many also feel it's rather smaller than expected when you actually get to see it in the flesh. It's still quite a beauty, though, without question. There's another, much smaller and less spectacular church, namely Kazan Cathedral at the northernmost corner of Red Square. Personally, however, my favourite piece of the architectural ensemble around Red Square is the striking style of the deep-red-and-silver façade of the State Historical Museum at the north-western end of Red Square (the contents of the museum are far less remarkable, though, at least for me, but if you're into more ancient history then it might be worth considering). Next to the bottom of Red Square, beyond its south-eastern end, Zaryadye Park was under construction at the time of my latest visit, but it has meanwhile been completed. It's a large landscaped garden with several modern features, such as the glass-roofed concert hall and open-air amphitheatre, or the remarkable pedestrian “V-Bridge” or “floating bridge” that juts out over the Moskva River (but without crossing it, it just seems to “hover” over it and switches back to the park) or the Media Centre with lots of digital multimedia features.